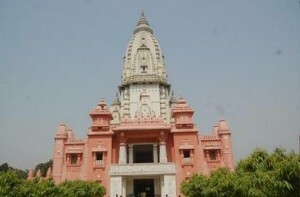 The New Sri Vishwanath Temple / Birla Mandir is located in Kashi / Varanasi in the Banaras Hindu University (BHU) campus. Made of white marble, the tall temple has a height of 76 m / 250 feet. In Sri Vishwanath Temple, there are 9 temples. Vishwanathji (Shiva Lingam), Natarajji, Mata Parvatiji, Ganesji, Mata Saraswatiji, Panchmukhi Mahadev, Hanumaji, and Nandiji. There are idols of Lord Shiva and Lakshmi Narayanji. The temple was built as a replica of the ancient Kashi Vishwanath Temple. The temple is a part of the campus of Banaras Hindu University (BHU) that was established by Pandit Madan Mohan Malaviya. The temple was established in 1931. The temple construction was completed in 1966. It is open to people of all castes and religions.